End of Public Servants' Strike in Sight? Cape Town — South African government negotiators have improved their pay offer to civil servants in a bid to end a crippling nation-wide strike which has lasted for more than two weeks. Unions have yet to decide on the offer, but labour leaders signalled in interviews early on Tuesday that they were in favour of their members accepting it. A government statement issued Tuesday said that, acting on a directive from President Jacob Zuma, negotiators had returned to talks with public service unions and negotiated a "draft settlement offer" of a 7.5 percent pay increase and a monthly housing allowance of R800 (U.S. $110). The government's previous offer was a seven percent pay rise and a R700 housing allowance. Unions have been demanding 8.6 percent pay increases and a housing allowance of R1,000. "The public service unions have requested more time for consultation on the draft settlement offer with their members," the government statement said. Negotiators would return to talks on Wednesday. A spokesman for one major union coalition, the Independent Labour Caucus, was quoted by Bloomberg news as saying the strike would "in all probability" be called off. 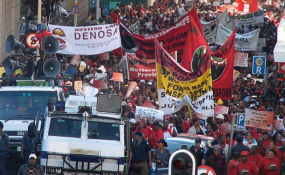 In an interview with the SA Broadcasting Corporation, a spokesman for the Congress of South African Trade Unions was more guarded but hinted that it would be difficult to continue the strike for the time it would take to secure any further improvement in the government offer.